The 1st Regiment Kansas Volunteer Infantry (Colored) was an infantry regiment that served in the Union Army during the American Civil War. It was the first black regiment to be organized in a northern state and the first black unit to see combat during the Civil War. At the Battle of Poison Spring, the regiment lost nearly half its number, and suffered the highest losses of any Kansas regiment during the war. The 1st Kansas Infantry (Colored) was organized by the work of Senator James Henry Lane at Fort Scott, Kansas and mustered in as a battalion (six companies) on January 13, 1863, for three years. Four additional companies were recruited and mustered in between January 13 and May 2, 1863. It mustered in under the command of Colonel James M. Williams. This regiment was recruited without federal authorization and against the wishes of Secretary of War Edwin M. Stanton. James H. Lane, recruiting commissioner for Kansas territory north of the Kansas River, on August 4, 1862, authorized raising the regiment. Recruiting officials enlisted black men across eastern Kansas, most of whom were former, or runaway, slaves from Missouri. It was the first African-American regiment to see combat during the Civil War, in the skirmish at Island Mound, in Bates County, Missouri, in October 1862. 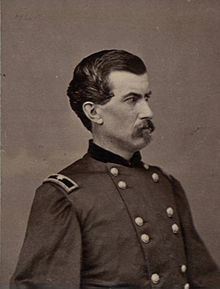 The regiment’s company D had three black officers, William D. Matthews and his two lieutenants, Henry Copeland and Patrick Minor, who were not allowed commissions as officers when the regiment was formally mustered into the Union army. The regiment was attached to Department of Kansas to June 1863. District of the Frontier, Department of Missouri, to January 1864. Unattached, District of the Frontier, VII Corps, Department of Arkansas, to March 1864. 2nd Brigade, District of the Frontier, VII Corps, to December 1864. The 1st Kansas Infantry (Colored) ceased to exist on December 13, 1864, when it became a U.S. Army unit and its designation was changed to the 79th Regiment Infantry U.S. Colored Troops. Also attached to the regiment at some point was Armstrong’s Battery Light Artillery, a unit for which few details are known. Duty in the Department of Kansas October 1862, to June 1863. Action at Island Mound, Mo., October 27, 1862. Island Mound, Kansas, October 29. Butler, Mo., November 28. Ordered to Baxter Springs May 1863. Scout from Creek Agency to Jasper County, Mo., May 16–19 (detachment). Sherwood, Mo., May 18. Bush Creek May 24. Near Fort Gibson May 28. Shawneetown, Kan., June 6 (detachment). March to Fort Gibson, Cherokee Nation, June 27-July 5, with supply train. Action at Cabin Creek July 1–2. the Battle of Honey Springs, July 17. At Fort Gibson until September. Lawrence, Kan. July 27 (detachment). Near Sherwood August 14 Moved to Fort Smith, Ark., October, thence to Roseville December, and duty there until March 1864. Horse Head Creek February 12, 1864. Roseville Creek March 20. Steele’s Camden Expedition March 23-May 3. Prairie D’Ann April 9–12. Poison Springs April 18. Jenkins’ Ferry April 30. March to Fort Smith, Ark., May 3–16, and duty there until December. Fort Gibson, C. N. September 16. Cabin Creek September 19. Timber Hill November 19. The regiment lost at least 344 men during service; 5 officers and 173 enlisted men were killed or mortally wounded, 1 officer and 165 enlisted men died of disease. No other Kansas regiment lost more men than the 1st Kansas Volunteer Infantry (Colored). In 2011, quilt artist and educator Marla Jackson worked with junior high students in Lawrence, Kansas, to produce a collaborative and commemorative quilt on the topic of the 1st Kansas Infantry. The quilt, along with several others by Jackson that evoked similar themes, was displayed at the Spencer Museum of Art. ^ kbarker@joplinglobe.com, Kimberly Barker. “Historian spotlights the story of the 1st Kansas Colored Infantry in Civil War series”. Joplin Globe. Retrieved 2018-11-08. ^ Honey Springs, Elk Creek, Shaw’s Inn – Civil War Oklahoma American Civil War July 17, 1863.” Retrieved August 25, 1863. ^ “First to Serve.” National Park Service. Fort Scott National Historic Site.” Retrieved August 30, 2014. ^ “The First Colored Troops of Kansas | Exhibitions | Spencer Museum of Art”. www.spencerart.ku.edu. Retrieved 2016-01-25. Official Military History of Kansas Regiments During the War for the Suppression of the Great Rebellion (Leavenworth: W. S. Burke), 1870.